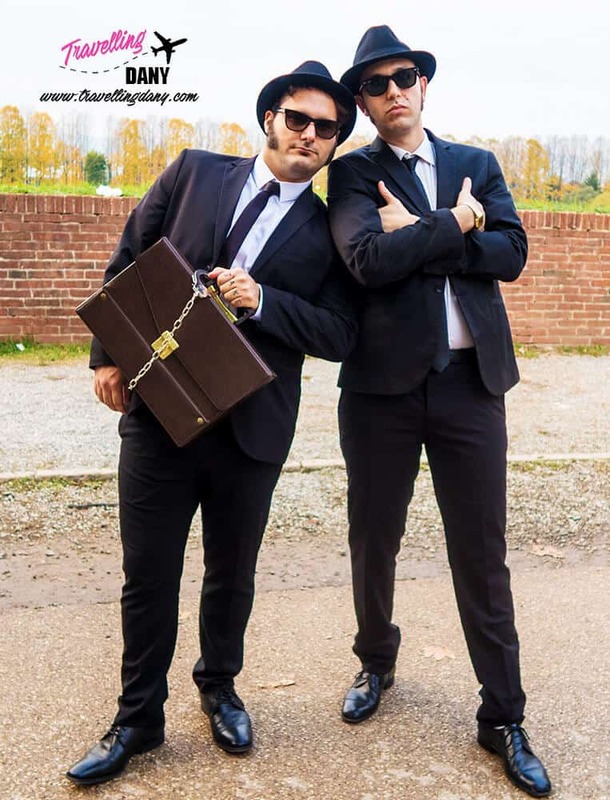 Lucca Comics Cosplay: what are we even just talking about? Elves, Space Marines, Jedi, Sith, Assassins, Thieves, and even Androids. Once a year, since 1966, in Lucca, a beautiful little town in Tuscany (Italy), not too far away from many of the cities that made it into my list of favorite Italian getaways, a huge number of fantasy worlds meet, intertwining in a single, intricate and colorful plot. 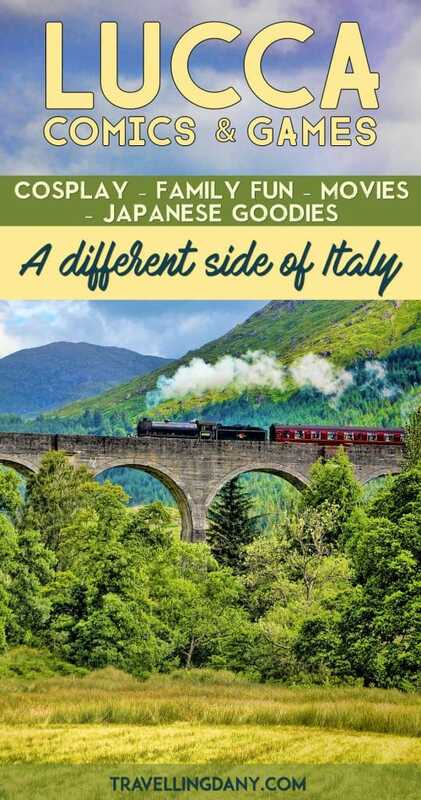 We have already talked about this event, with an up-to-date guide to Lucca Comics & Games, which I hope will be useful even to those who have never been there. This time I would like to focus on the Lucca Comics Cosplay, which attracts fans and artists from all over Europe. 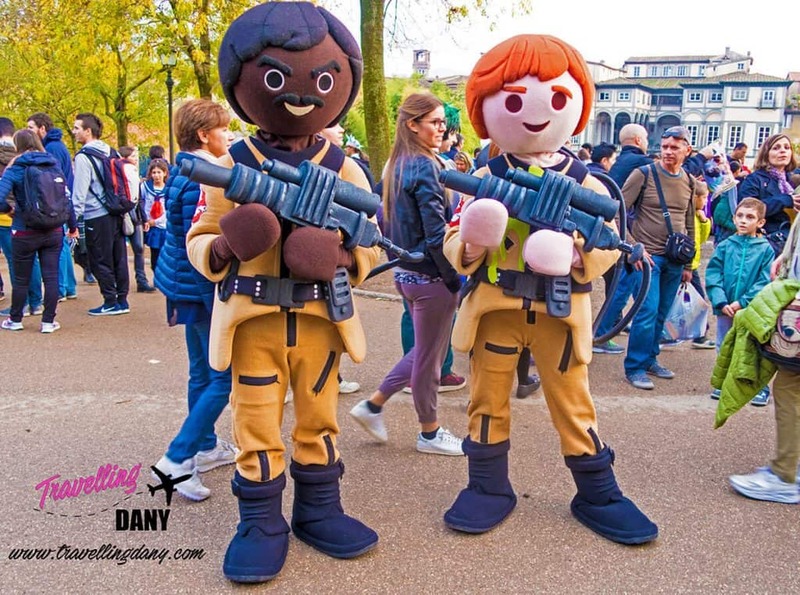 I have to admit that the work of the incredible cosplayers, veterans and newbies, who attend Lucca Comics & Games, is one of the main reasons me and Aldo have been taking part to this event for years. The word cosplay comes from “costume” and “play“, and indicates the art of wearing a costume representing a character and playing that same character. The term was created in 1984 by a Japanese reporter, Takahashi Nobuyuki, after a trip to the United States, where for many years some people had begun to sew their costumes, inspired to their own favorite characters, to participate to themed conventions. However, it was only in 1995 that the Japanese press devoted itself to this phenomenon. Specifically, they wrote about a group of Tokyo kids who wore costumes inspired by the Neon Genesis Evangelion franchise (now you know why we were fangirling all over the Evangelion XR ride at Universal Studios Japan!). We can say that they managed to give to this phenomenon a mainstream trait: since then, in fact, cosplay has become more and more widespread. Sure, there will always be someone ready to turn their nose up. I’m certainly not a “professional” cosplayer, but I will never forget the “You’re weird” from the wife of one of our friends, when we told her of how we meet once a year with our friends in a ranch to wear costumes inspired to western movies and tv series. Soon after (unfortunately I’m not joking), she unfriended me on Facebook and disappeared from my life. The old saying “live and let live” is not for everyone. Nowadays it’s quite common to see cosplayers in Tokyo, especially on Sundays: it’s part of the otaku culture. 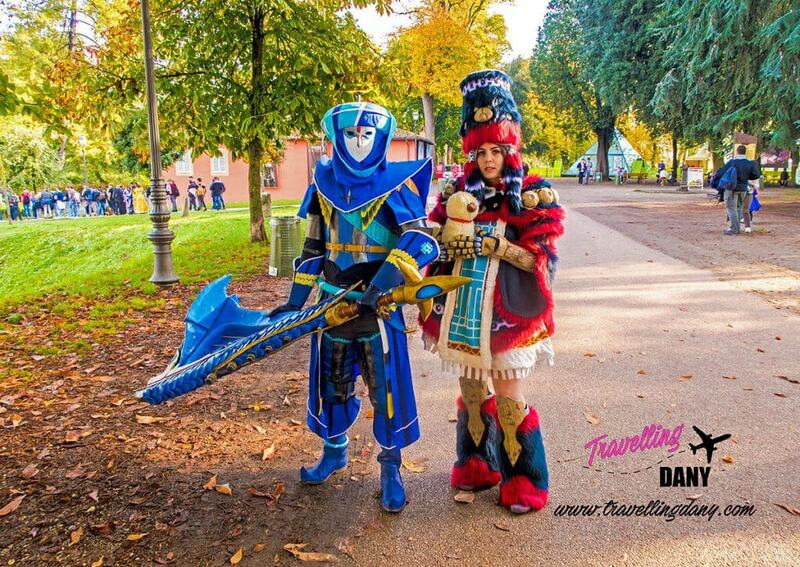 Stefania and Luca, representing Monster Hunter Generation: find their costumes here! Many believe that you can just wear a nice ready-to-go costume, maybe recycling the one you bought to celebrate Halloween. And that’s how you become a cosplayer. Actually, I have seen more than one expert turning up their nose in seeing costumes that to me looked absolutely wonderful. “They bought it.” There’s no faking it, cosplay costumes have to be handcrafted! Being a cosplayer is a serious thing. A real hobby, often cultivated over the years. There’s no fun in buying a ready-to-go costume. On the forums and on the official Lucca Comics & Games facebook page, it won’t take you much to find posts from boys and girls on the verge of a panic attack. Oh my gosh, Lucca Comics is in two weeks and my costume isn’t ready! Yes, because it takes months to craft the wonderful costumes you see in these photos. There are those who go at it with a sewing machine and lots of patience, and those who let their creativity do all the work, incorporating common use items into their costume. I was impressed by a steampunk cosplayer who used a skimmer as an antenna for his futuristic hat, but at Lucca Comics Cosplay you’re bound to learn that there are much more creative uses to the things you see every day in your house! In Lucca, for the Lucca Comics and Games, there are thousands of people who are proudly wearing the costumes they crafted by hand with hard work, spending money and sleepless nights drawing, sewing, glueing… just to start all over again if they aren’t satisfied with the results. I have often read that the greatest compliment for a cosplayer is to have a large number of people approaching them to take a picture. Actually, I think that their biggest challenge is to put together a costume that, in great detail, represents the one they have seen on their favorite character. And wearing it in such a big event, chin up, because they know they have done all they could. Walking for hours on high heels, with a tiny costume like Lum from Urusei Yatsura, even when outside it’s freezing cold, taking part to the parades even if it’s raining hard, riding overcrowded trains just in order to present your newest creation to a Comic Convention. Being a cosplayer can be tough, and yet they still love what they’re doing. Sometimes people tend to underestimate all the work they do in order to craft a costume they like. So perhaps if you look at it from this point of view, then yes, asking a cosplayer to pose for a picture is like paying a compliment to their creativity. But they will definitely be much more pleased if you stop by and tell them: don’t be afraid to ask them questions about their costume, they are always willing to chat! While we were visiting Kyoto we met a few fellow Italians who were looking to buy original Japanese fabrics (which can definitely be bought as cool souvenirs from Japan) to sew a few costumes for anime that we don’t even have in Italy “officially”. This is the kind of dedication they have. 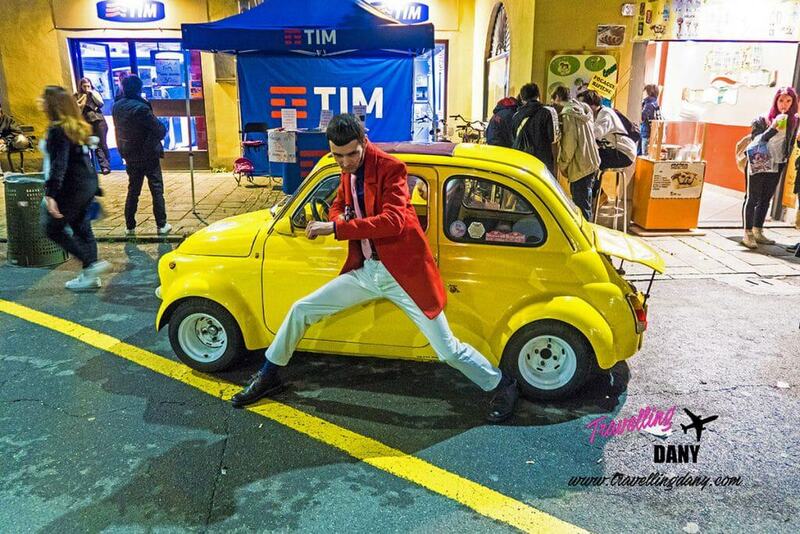 Lucca Comics Cosplay also means posing for lots and lots of pictures. At Lucca it’s easy: wherever you go, you’ll have an awesome monument or building as a backdrop. “Becoming” a character, for a cosplayer, means that they have to study poses that emphasize their costumes when in front of a camera. Things become much more complicated though when there are group cosplay like the Akatsuki from Naruto or the Nazgul from the Lord of the Rings. Coordinating many people, in fact, is by no means simple. But Lucca is perfect for this because they have a whole ancient town they can use as a stage. Over the years two groups have become something absolutely stunning. The Umbrella Italian Division and the 501st Italica Garrison. It’s been a few years already that the Lucca Comics & Games management has offered a big space on the Medieval walls that surround Lucca to the two groups, created by a handful of people in love with Resident Evil and Star Wars. The Umbrella Italian Division, always promoting zombie walks or themed shows for the Resident Evil franchise, has now become a reference point for the science fiction re-enactment. To put it using their own words, they reenact a fictional atmosphere, but in a real and plausible context, to engage the audience to a much deeper level. In their dedicated area, we found military vehicles with turrets and sentinels, a “zombie bus” people could enter for a good scare and even a (fake) helicopter. A few make-up artists applied zombie make-up for free: for the whole 4 days of the convention, a long line of kids and grown ups has asked for “half zombie” or “full zombie” make up. The great dedication of this no profit organization is truly an inspiration for many other groups in Italy and abaorad! The 501st Italica Garrison is the Italian branch of a worldwide organization of Star Wars saga fans. The 501st Legion has been featured in the Guinness Book of Records as the world’s largest Star Wars costuming club in the world. In Italy there are about 130 members, divided into 5 teams that cover the national territory and who participate in major national and international conventions. Famous not only for the magnificent costumes, but also for the hard work they do for charities as Amref, Unicef or the Italian Red Cross, the 501st Italica Garrison guys have been busy for years, trying to offer an increasingly “realistic” experience to the viewers. I think the only way one could understand what I mean would be to see the face of a little kid who meets one of their Jedi or Stormtrooper: it’s priceless. They truly believe that their heroes are real. 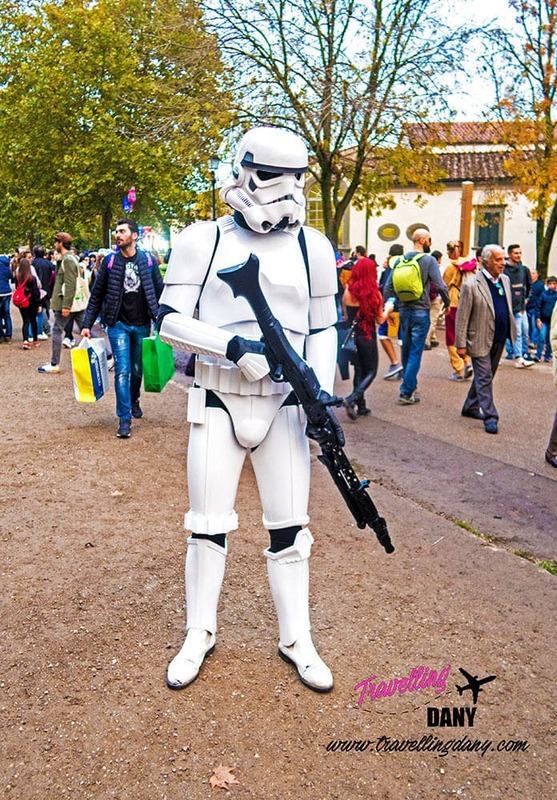 During the Lucca Comics & Games 2017, to commemorate the death of Carrie Fisher, the actress who, in addition to many other iconic roles, played Princess Leia in the Star Wars saga, the 501st organized a series of flash mobs. Hundreds of fans responded to their call not only to remember a character from the Star Wars saga, but to remember a brave woman who wasn’t afraid to talk about her bipolar disorder. Me and Aldo took part to one of the flash mobs and we sincerely believed that nobody was ever going to talk about her bipolar disorder. It was a comic convention and here people still shy away from such topics. However, we were pleasantly surprised by the fact that Carrie was reminded as an incredible woman who, even after passing away, is teaching people that there is no need to feel ashamed of sharing our own pain. Mental illness shouldn’t be a topic we can’t talk about. Hats off to these people who are trying to break a taboo explaining it so tactfully. 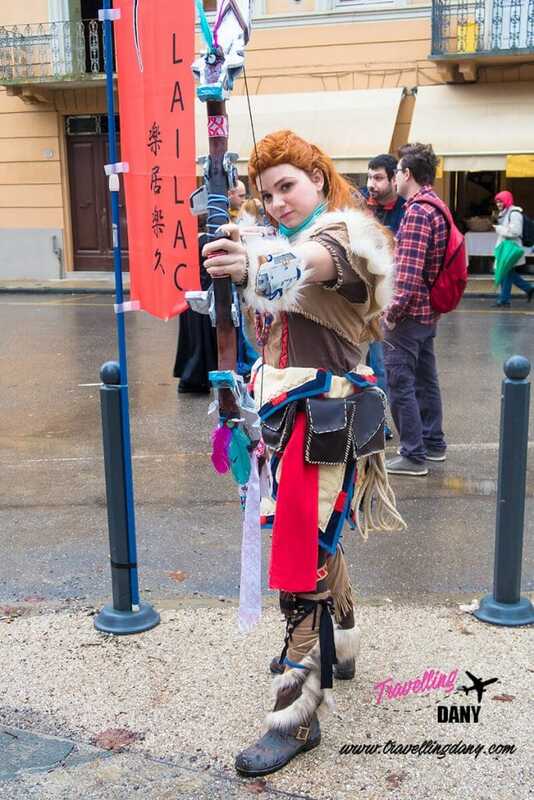 The 2017 edition of Lucca Comics Cosplay also saw the presence of great names in the video games industry such as Activision and Blizzard, who brought big pavillions and gaming stations at Lucca Comics. Yet they also also promoted a few cosplay initiatives. Being a World of Warcraft player since vanilla, I have to say that it was awesome to see so many of my favorite characters from the saga parading in the streets of Lucca. It showed that this MMORPG still has a lot to offer. We almost expected to be the only ones interested in the live streaming from the Blizzcon opening ceremony in Anaheim (CA) and instead… the enthusiastic cries of joy from dozens of WoW fans made us feel part of a big family. After a few years of a complete invisibility, it was great to see Blizzard back to the Lucca Comics and Games! 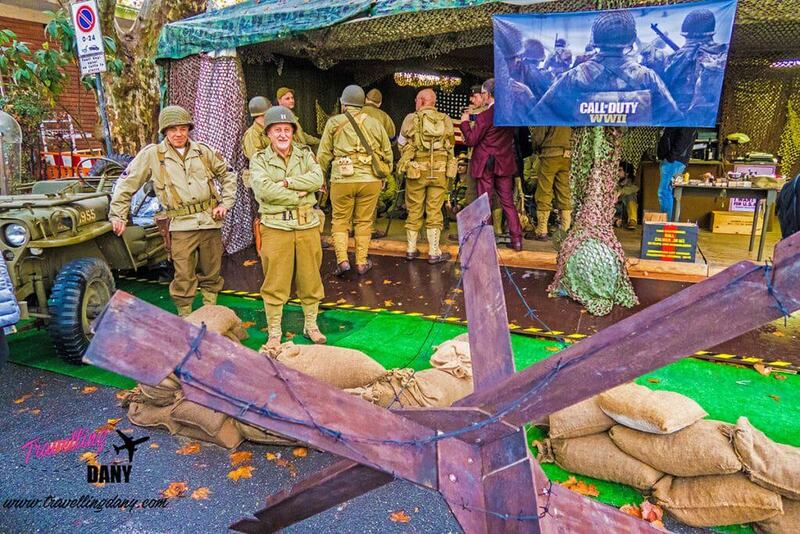 Activision dedicated a large pavilion to Call of duty: WWII in Santa Maria Square. 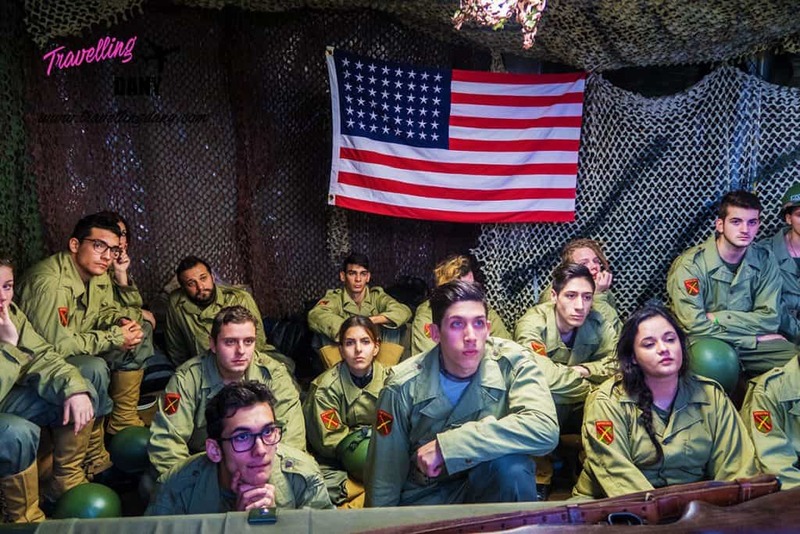 A total of 100 gaming stations, show matches broadcast on a huge screen, and above all, the rebuilding of a US military headquarters in the Second World War with authentic jeeps dating back to the 1940s. Once again, the cosplay has turned out to be the perfect means of delivering a message, in this case by fuelling the hype for a video game that came out in the early days of November 2017. You just have to look at the faces of these guys to understand that it was the right choice. 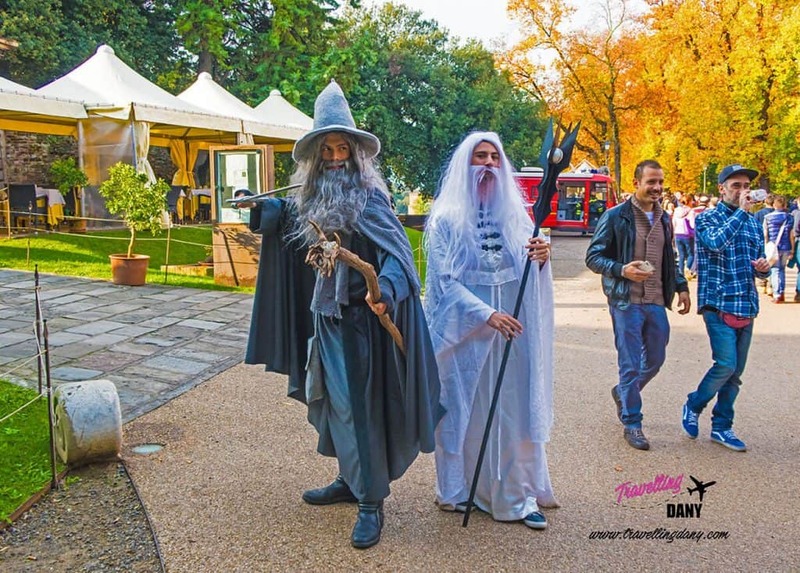 Each year Lucca Comics Cosplay also organises the oldest cosplay contest in Italy. A major hook-up for every cosplayer throughout the Country. 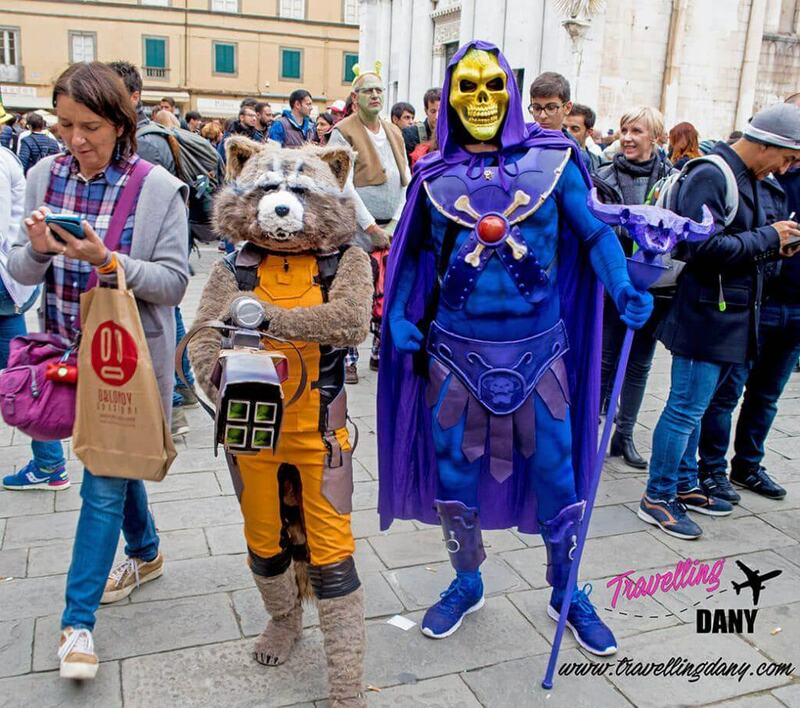 You can sign up for the cosplay contest either online, filling a specific form, or in Lucca during the Lucca Comics and Games: it’s completely free. The contest is held every year on the last day of the convention, on the Lucca Comics stage located in Baluardo San Donato. The cosplayers will have to provide some reference photographs that they used to create their costumes, and play a little sketch of the character they are portraying on stage. 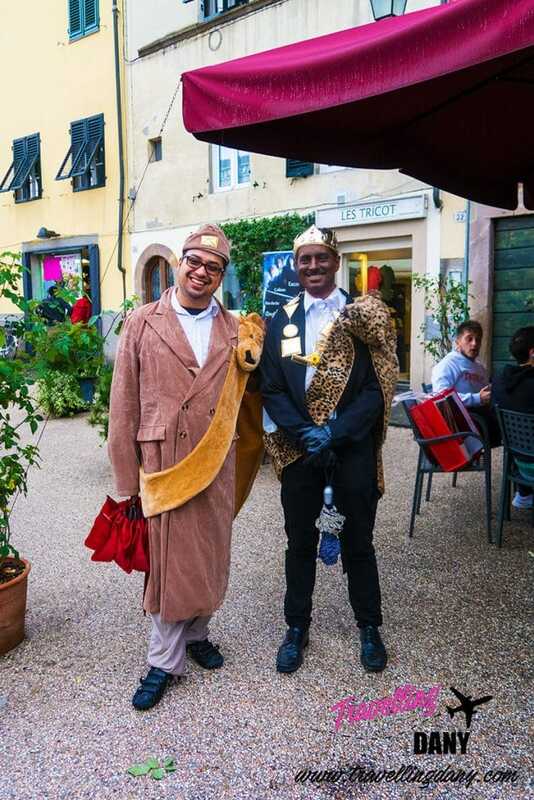 There are many categories in this contest, and range from the best characters (man and woman) to the most difficult costume (obviously hand made), to the best acting, just… like some kind of Oscar ceremony in the middle of Tuscany! 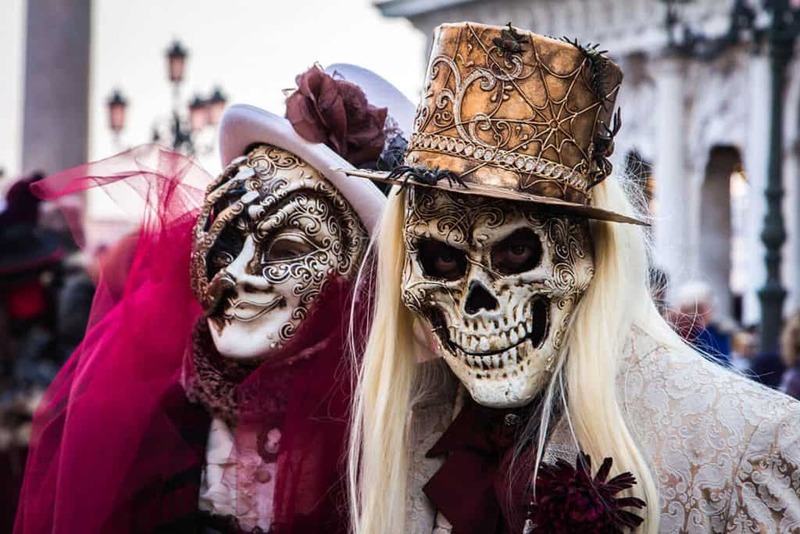 Many people get scared of the crowds who take part to the Lucca Comics and Games, after having read exaggerated reports from the previous years. Some even claimed that attending can be “dangerous“. 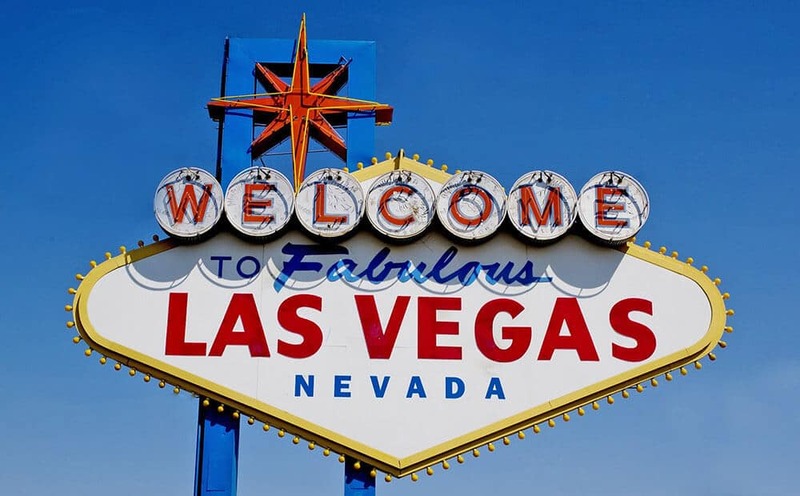 It’s been a few years now that the organization has chosen not to sell more than 80.000 tickets for each day of the convention. But to be honest, even before that, I’ve never felt in danger. The crowds in Lucca are quite polite, if they push you, they will apologize right after. There’s a huge number of families who take part to this event also with very young children in tow, and that’s why there’s also a “Junior area” where kids can play with their parents. The educational pavillion offers insights on how comics are drawn, but also teaches kids how to make origami, among other things. 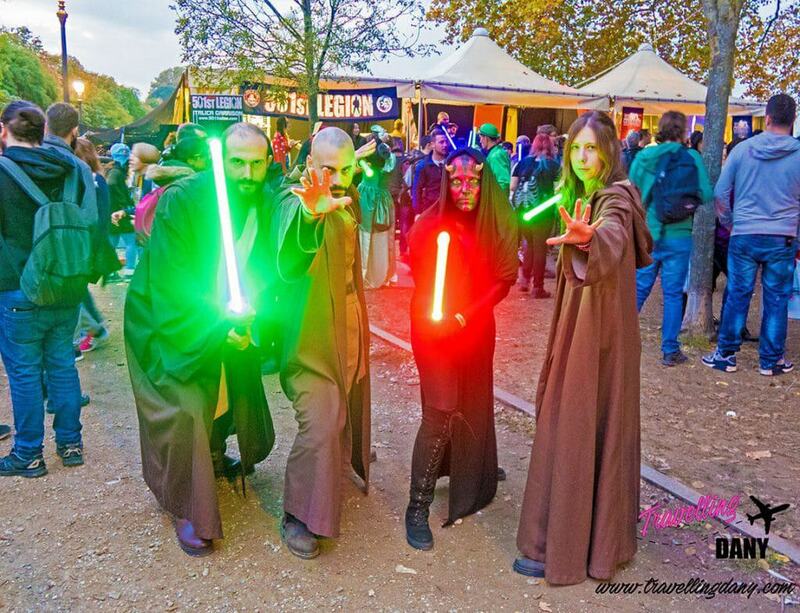 Lucca Comics & Games is becoming, now more than ever, an Italian event suitable for both adults and children. 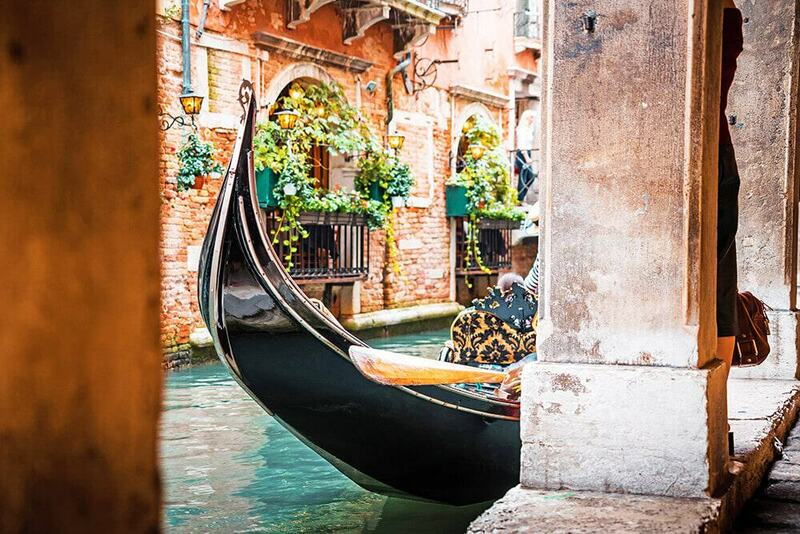 Attending the Lucca Comics & Games doesn’t require a ticket. The event takes place in the whole town, inside the medieval walls: every shop decorates its windows with superheroes or manga characters. Unless you want to enter one of the pavillions where they sell merchandise and comics, or attend one of the exhibits, then you can just walk around for free. Lucca Comics Cosplay attracts every year a huge number of cosplayers: you can just meet them in the streets, they’ll be more than happy to pose for a few photos. If you are worried about the crowds, I suggest you attend the Lucca Comics the first or second day, avoiding the busiest days of the fair, generally Saturday and Sunday. Every year during the Lucca Comics Cosplay there will be quite a number of parades that circulate freely within the city walls. That’s why if you are specifically interested in seeing the cosplayers, you won’t need to buy a ticket. Just make sure you are wearing comfortable shoes and always check the weather conditions before to head to Lucca. There’s so much to see, which is why, especially if you get there using a train from Florence or any other big city in Tuscany, you will walk a lot. While the city might seem tiny, and the train station is very close to the city walls, there is no public transport inside. Because the convention spreads all over Lucca, the only way you have to see everything is by walking. If you are in Tuscany for a trip between the end of October and the beginning of November, I strongly suggest you not to stop only in Florence, even if it’s an absolutely beautiful city. Tuscany’s small towns, just like Palazzuolo sul Senio, are certainly worth a day trip. 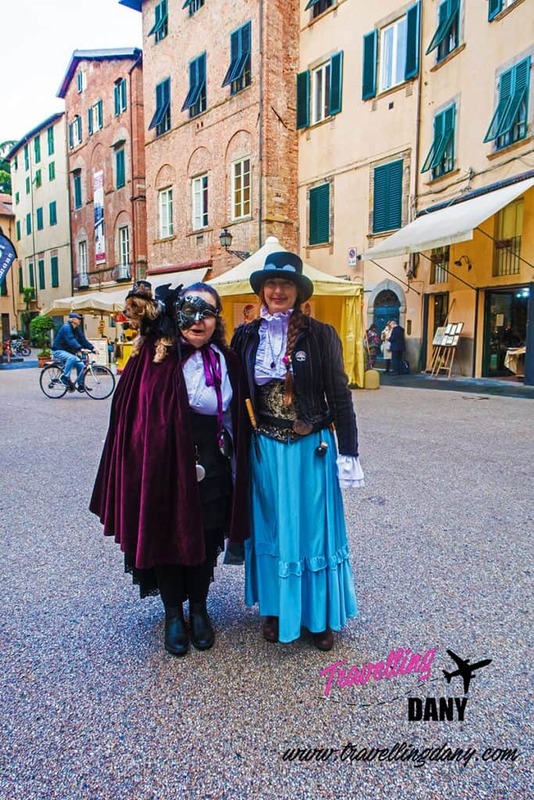 And then, even if you aren’t huge nerds, visiting Lucca during Lucca Comics might be a way to experience a very unusual festival. You might be wondering why I have mentioned Japan in the title. While you might have understood how deeply rooted the Japanese culture is in this Italian festival, I didn’t only refer to it because of the cosplayers. Japan is one of the main “themes” at Lucca Comics and Games. Every year there are more and more events dedicated to the Japanese culture and traditions. A big area of the city, during the convention, is in fact renamed “Japan Town“. Here people will be able to attend Japanese fashion shows, or themed events and exhibits that represent the Japanese culture. Buying a ticket for the Lucca Comics you will be able to attend calligraphy courses, seminars that teach you how to translate from Japanese, or courses that will explain what to do if you want to move to Japan. In the Japan Town area there are small shops selling Japanese handicrafts and merchandise inspired by animation and manga masterpieces. Hayao Miyazaki, Studio Ghibli, but also One Piece, Bleach and Dragon Ball, just to name a few. You will also be able to experience the Matsuri traditional Japanese festival, with yukatas, kimonos and traditional Japanese games. Mangiappone is a large stand, always pretty crowded, which sells Japanese food. You can order sushi, onigiri, ramen and noodles, or Japanese drinks unavailable in Italy except from the few days of the Lucca Comics. If even the long queues won’t scare you, I’d still recommend having an early lunch there, to be able to sit at one of the few tables available to their guests. The first two days of the convention are pretty good, because there aren’t too many people, so it won’t be difficult to find a spot at Mangiappone. Many people at Lucca Comics eat “Japanese cup noodles“. They are pretty cheap and the sellers offer the chance to use hot water to melt the spices in your cup. Yet if I have to be completely honest, I’m not a huge fan! After all, with all the delicious dishes from Tuscany, I prefer to rely on the traditional recipes! 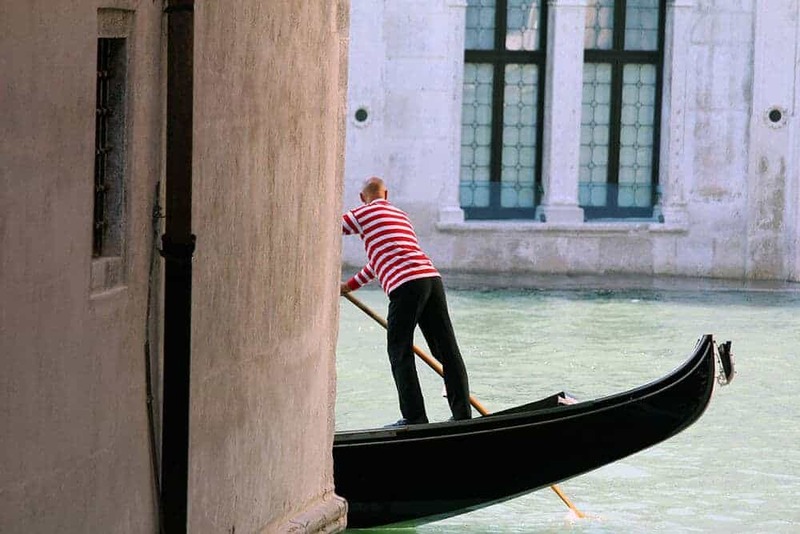 And please when you visit, make sure you apply our Italy tipping etiquette! Another unmissable event for those who attend the Lucca Comics Cosplay is a concert usually set for a Saturday. On stage, Cristina D’Avena, who sang the most beautiful cartoon songs in Italy. Here we all grew up with her voice and it’s an incredible experience to see so many “grown ups” attending her concert, wearing costumes from the cartoons she is singing about. The concert is free for those who have bought the ticket to attend the Lucca Comics & Games, and it’s yet another way to discover a slice of Italy that you won’t find in any travel guide! Same here Anshul! Are there any comic events where you live? 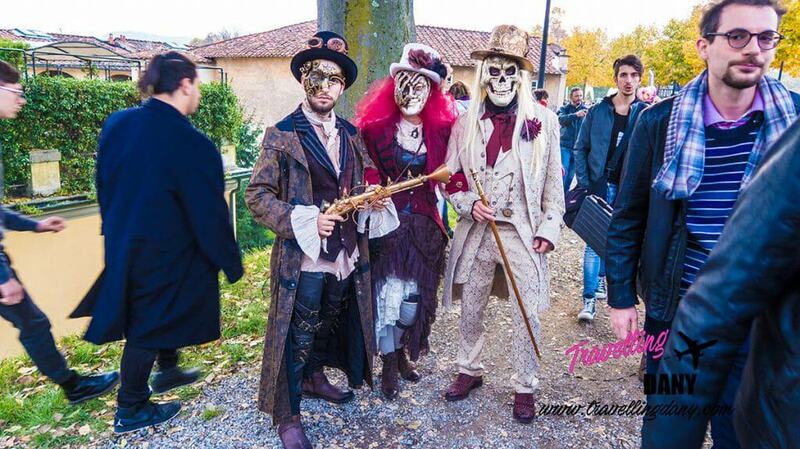 Lucca comics cosplay seems like a great fun event. What a colourful and fascinating scene. I for one would feel as if I had fallen into a dream and woken up in a fantasy world of comic characters. You’d have so much fun! Cosplay events are some of the most fun there are. Even if it is not quite your usual scene, you can’t help but appreciate such passion and commitment! Lucca is such a fantastic place, we loved our time there. To be there during such a major event would be so much fun! You’d be surprised, really! It’s not “forced”, it’s just like a huge party! We thought this was one of Tuscany’s prettiest towns. Lucca seems transformed with this lively comics festival on its medieval streets. We visited on a non-festival day and experienced a very different character of the town. Lucca it’s much more quiet in any other day but for the Comics it changes completely! What insane costumes! Amazing how many people get into this. I think it would be super fun to be part of. And I agree with an earlier comment here – I’d totally go for the Dr Who companion too! It’s the biggest cosplay event in Italy! As someone who has never been involved in anything like this or felt a desire to, I find all of this very interesting. It’s a whole sub culture of activity isn’t it? Hand crafted costumes is such an added delight as it really shows those who are willing to put so much into it all. The backdrop of Italy is also quite amazing but another telling sign of just how different and surprising the world can be. Oh yes it is! And you’d be surprised but it’s really an event for everyone! Lucca looks like a beautiful place to visit! I’ve never been to a ComiCon, but it sure looks like a lot of fun! I love all of the costumes! And sounds like there was a lot of fun events going on! You have to pay for the events but it’s still a huge party that involves the whole town! Crazy cool event – I would love to take it in if in Europe at the same time. Interesting to hear of a Japanese festival in Tuscany – very cool though! Screw the friend on Facebook who thought you were weird though – seriously, if people are willing to defriend someone over enjoying costume events, they’re the weird one!! Amazing to think that these costumes are handcrafted and the passion project of many months of hard work. I’m constantly amazed by people’s creativity! 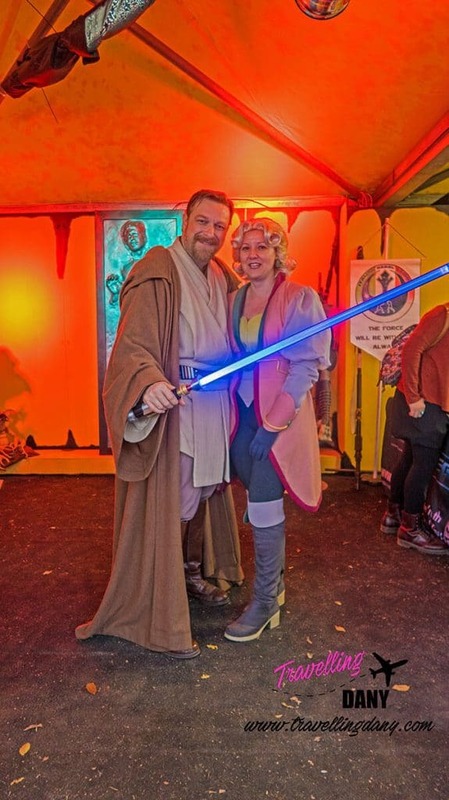 Love that you can rock up for free and enjoy people’s costumes – cosplay probably isn’t something I would be full time passionate about, but I would love to dress up and join the fun! The Japanese culture in Tuscany grew strong thanks to this event, now they also have yet another Japanese themed event once a year! I am not into comics but this sounds like the perfect photography event for me. I would not mind spending some hours wandering around the people admiring their beautiful costumes and taking cool shots. There are similar events in Paris but not that important like the one in Lucca I guess. It’s what we love to do too! And I had no idea that they had a cosplay event in Paris, wow!!! This is fascinating! I know Lucca but I had no idea that you could find cosplayers there! I was lucky enough to see and photograph cosplayers in Tokyo and the experience was unbelievable. As I see from the pictures here, the level of this convention is really high and some costumes are like taken out of a movie! Attending a cosplay event in Tokyo is my dream, I can well imagine how cool it was!!! Comic event is a new thing for me. Not a big fan of comics and hence do not know about Lucca, so this post was entirely a new thing for me. Thanks for introducing me to Cosplay which is a nice theme for an event and in general. Loved all this lively photographs especially of that girls with Bow and Arrow. Would certainly search more on Cosplay and comic event. Lucca is a beautiful town in Tuscany, Italy, which you can visit also when there’s no ComiCon! 🙂 I’m glad you liked the pictures and hopefully you will also find a cosplay event near you! I think you’d have so much fun! Wow Amazing! With so much work gone in to making the costumes they must be terrific! Loved the different themes. Indeed it is, a whirlwind of colors! This is a fascinating post as I’ve always been intrigued by cosplay. I had no idea that costumes had to be handcrafted and couldn’t just be purchased – that’s crazy! 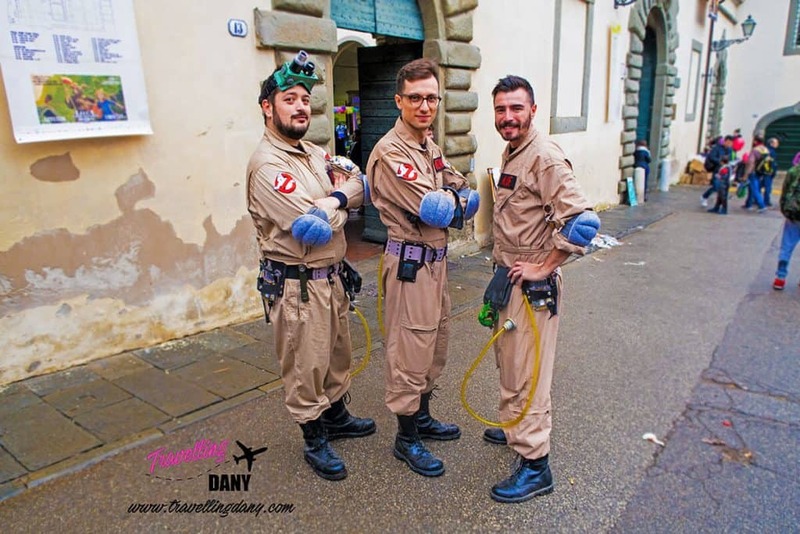 Lucca Comics Cosplay sounds like an insane event – I don’t know that I would fit in but I’d love to be a fly on the wall! Thank you so much for sharing so all of us non-cosplayers can live vicariously! 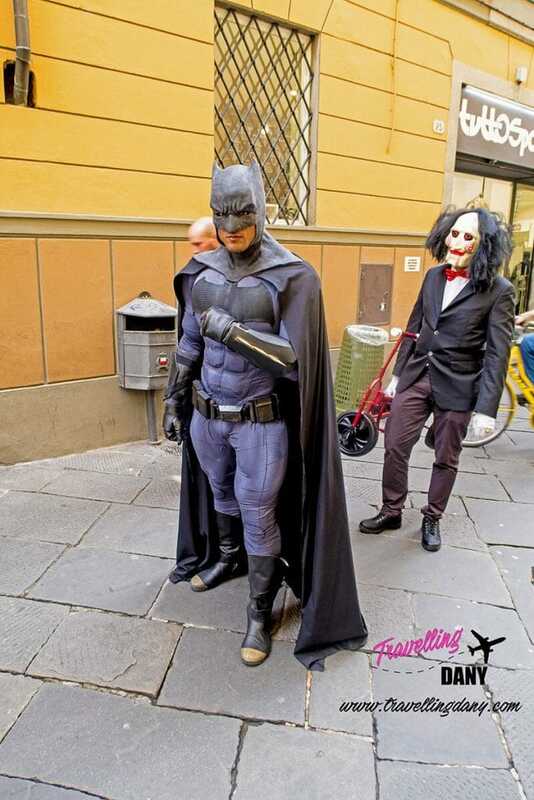 I’ve heard of cosplay in Japan but didn’t realize it was big in Italy too. This was a fascinating insight, especially to find out that all the costumes are hand-crafted. I’m impressed by the creativity! It’s becoming bigger and bigger. We have smaller comic fairs now also in Naples, Milan and Rome, among others, but Lucca is the oldest and biggest of all! This looks like a hoot! I never think of cosplay being a thing to travel for, but it looks amazing! I would want to dress like a Doctor Who companion or something fun! You’ve included some great tips for comfort too! We do travel from Naples to Lucca every year and thousands of people go there as well, in Italy it’s very, very popular! And lol last year they had a huge Doctor Who show too! I love this! I have lots of Cosplaying friends and love to see the work they put into their costumes. I didn’t realise the Lucca Comics Cosplay was so huge – I always just think that Japan and America as being the biggest cosplaying countries – but yay for Italy for throwing such an awesome event! Just think that the whole town becomes one huge cosplay event, I think it’s the biggest fair in Italy! And still… my dream would be to see a cosplay event in the US and in Japan!!! Oh wow congratulations! What costume was he wearing? Oh how marvellous. I love the exuberance and perfectionism of cosplay but very much as an observer, never thought to take part. There is something wonderful about the creativity, and commitment, in creating the costumes, you are right that just buying one off a peg wouldn’t be the same. Really enjoyed reading about the history of the Lucca Comics Cosplay and the different themes through the years. Good to know you can go as an observer without charge, I’d love to incorporate that into a trip to the area. I think that getting involved into cosplay takes a lot of courage. Our cosplay for example was much more private, we were at a small ranch, not in the middle of huge crowds: being shy, I’d feel embarassed in being stopped every minute from people asking to take a picture of me! And yet it’s a very fascinating form of art. 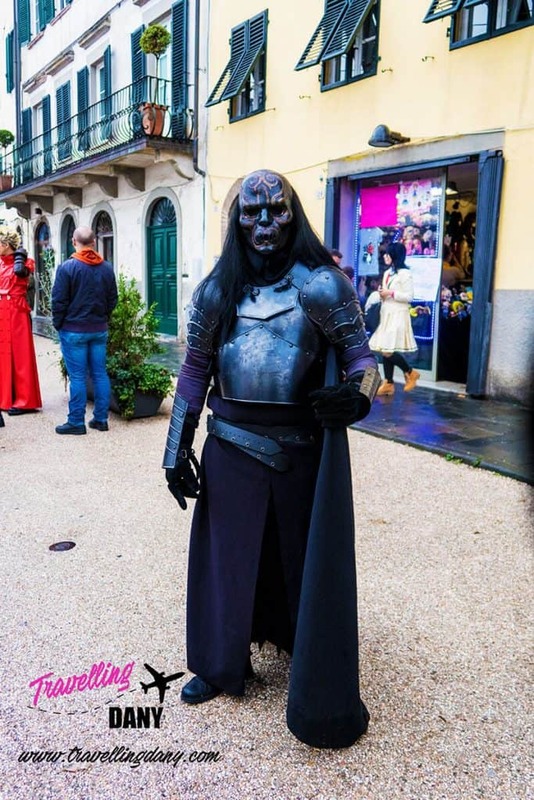 Some of the costumes at the Lucca Comics were absolutely amazing! Those costumes are amazing. I’ve been to Tuscany but had no idea there was such an event. It’s crazy that all of those costumes are handmaid! I know, here it’s very famous but strangely enough this event isn’t very well known abroad! Wow this was such an interesting read, I haven’t ever had such an in-depth look into this type of world! Very cool, and very impressive about all the effort that goes into these costumes. Thanks for sharing! Well if you plan to visit Italy between the end of October and the beginning of November you could attend the Lucca Comics! Such an interesting and fun concept, I’d love to get involved! Wow would you cosplay too? people are really investing on good set of costumes 🙂 all of them were so great and very realistic! Nice photos too. I love looking at cosplayers! It’s quite amazing reading about them here… from the preparation, to the actual event!.. It’s just incredible how much passion and dedication a person gives just to get in character! Good to know that it pleases cosplayers to have their picture taken. I will make sure to get one when I get to see them on one of my travels (I’m pretty awkward when asking for a photo or two. LOL). I was just as shy but I soon learned that for the effort they put into everything they do, it’s just like paying them a huge compliment! So cool!! I didn’t even know about this. Must be so much fun to witness! It reminds me a little bit of this fair in the Netherlands called ‘Elfia’ where lots of people gather together dressed up. Even better all the customes are handmade, so creative :). Elfa sounds cool, from the name… is it something related to elves? Never knew Italy has such grand cosplay events. Always thought it is more popular in Asian like Japan. The ironman suit looks cool! 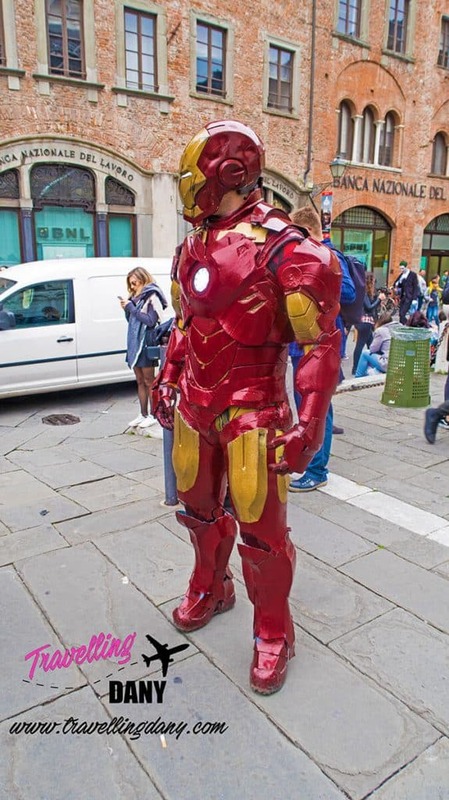 I would never have thought of Lucca as a hub for Cosplayers, but it’s truly spread worldwide now. I visited Lucca two summers ago and it was the picturesque Medieval town, just so “italian” and yet, this is proof that we are living in modern times. The costumes and the amount of fans that bring this event to life here is incredible! The Lucca Comics is 51 years old now! It’s been there for quite a while but as a well kept secret, or so it seems! 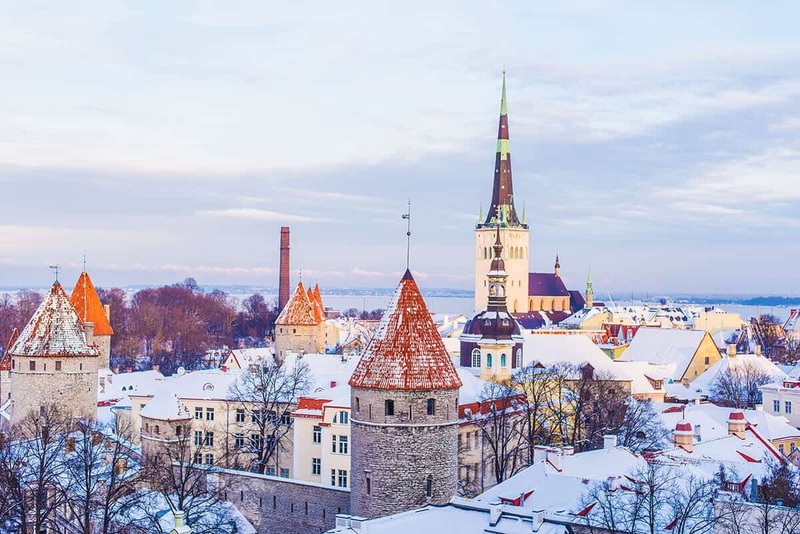 Not many people from abroad know about it and travel guides rarely mention it! Hello from Bangalore. We have comic con happening here next month. I am inspired buy your blog and shall try to create few ideas from here :)! Hello! It’s awesome, I’m so glad I’ve inspired you, thank you so much for your kind words! I’ve seen cosplayers out and about in Singapore and never really knew everything that was behind it! It seems super interesting and like you need a ton of dedication to it! There’s a lot of work behind every cosplay! Did you attend a cosplay festival in Singapore? How cool!!! I had no idea cosplay costume had to be hand crafted! I happened to go to the Brooklyn Botanical Gardens on a cosplay day and let me tell you the people watching was fabulous. Yes! It’s one of the things I love the most! WOW, il tuo articolo capita super a pennello perchè le mie amiche lucchesi (expat a Milano 😀 ) sono tutte tornate lo scorso week end per il Lucca Comics! Non sapevo che esistessero eventi di questo tipo cosi seguiti in Italia! -> non so se segui Pechino Express ma nella puntata di ieri c’era tutta una parte sui Cosplayers e la cultura giapponese! Safe Travels! Non seguo Pechino Espress, che peccato essermi persa questa parte così interessante! Però si, c’è stato un anno in cui il Lucca Comics ha segnato 200.000 presenze solo in una delle cinque giornate, tanto che hanno dovuto mettere un tetto massimo alla vendita di biglietti giornalieri. Direi che è diventato persino troppo mainstream!!! Haha! Never associated Italy with Cosplay. As nerds, we would absolutely love this. Mangiaponne sounds yum! We cannot get enough of Japanese food. And it’s free! We have gotta go! Haha it’s a well kept secret in Italy! But… nerds as well? You’d SO love this festival! They’d definitely appreciate it! Do you see cosplayers often? Months to craft a costume? Wow this is pretty serious, like a wedding. I had not heard about Cosplay ever before and i am glad i know of it now. This is super interesting.